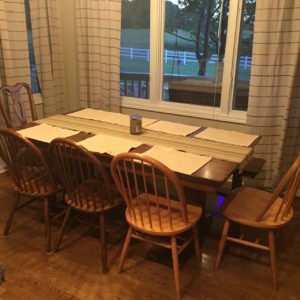 Home » Blog » Around the Dinner Table. . . .
For years it was merely a round table that sat in the corner of our family kitchen. The significance wasn’t in the object but in what was done around it. Whether we liked it or not, family dinner was a fact of life. Our seat order never changed. There was no “skipping” dinner. And the cardinal rules were: take some of everything, clear your plate and be pleasant. This is where we had the “opportunity” to eat lima beans for Dad’s birthday, because they were his favorite vegetable. This is where my radishes would strike up imaginary conversations with each other in order to liven up the dinner hour. And this is where we talked. There were never any silent dinners growing up and my parents made a point to be actively involved in both my sister and my life. School, work, cancer, family, sports, current events, faith, boyfriends, girlfriends and much more were discussed. Jump forward a generation and the foundation set by my parents continues in our Three Layers Deep household. Instead of a round table (and yes, we have tried a HUGE round table – our version of the Knights of the Buss table) we have a long rectangle farm table. After several years with chairs, we moved to a bench along the wall where four boys sit. My Dad sits at one end and Mom on his right. I occupy the other end and Kelly on my left. The prized seat at the table is the chair in between Mama and Mom. Why the prized seat? More leg room, no fighting with a brother on either side and easy access to the counter for more food. Same dinner rules as 20 years earlier but with much more VOLUME!! And I’m not just talking about the kids. “Did you hear that? Did you hear that? I knew that one was coming!” are the words after a shallow burp occurs at one end of the table. “Wait. . . Listen to this – BOOUUP! !” Jesse belches from across the table. Mama has started another burping challenge at the table and again failed to gain much support for her skill level. “Me Pray!! ME Pray! !” Joey quickly follows. “You prayed last night,” I quickly respond. “NOOOO! Me Pray!” And then tears start to flow. Eventually, everyone is seated at the table, hands are held, prayers are offered and the eating commences. The most fun part of the dinner hour? Any time there is laughter. “Put your napkins on your nose,” from a flustered Mama. Hiding a dessert as someone darts off to the bathroom. Oreo cookies ending up in eyeglasses to make a funny face. Who needs a half hour t.v. sitcom? We’ve got an hour of laughter and drama every night. When all is said and done, the last part of the dinner hour may be the most important. Nine people at a meal creates lots of dishes (rarely many leftovers in our household). Most everyone plays a role in cleaning up. No one person does it all. You are expected to help clean up. The National Center for Addiction and Substance Abuse at Columbia University did a study that reported teens who take part in a regular family meal are less likely to smoke, drink alcohol, use marijuana and other drugs. That same study also highlighted the fact that teens who frequently participated in family meals were 40 percent more likely to get As and Bs in school. Those are some convincing stats. But the dinner hour at the Three Layers Deep household has its roots in our foundation and a clear desire to keep building on the efforts of those who have gone before us.